"An Evening with George Shearing and Mel Torme (CD)" by George Shearing, Mel Tormé et al. Brian Torff is responsible for one composition (Manhattan hoedown) on this CD. An external link has been provided: Performance of Manhattan hoedown. Brian Torff is a contributing artist (bassist) and responsible for one composition (Manhattan hoedown) on this CD. Recorded live at The Peacock Court, Hotel Mark Hopkins, San Francisco, California, April 15, 1982. All God's chillun got rhythm (3:24) -- Born to be blue (5:06) --Give me the simple life (3:26) -- Good morning heartache (5:51) -- Manhattan hoedown (4:36) -- You'd be so nice to come home to (2:51) -- A nightingale sang in Berkeley Square (4:49) -- Love (4:36) -- It might as well be spring (4:25) -- Lullaby of Birdland (7:19). 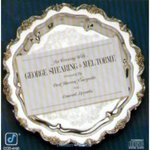 Shearing, George; Tormé, Mel; and Torff, Brian Q., "An Evening with George Shearing and Mel Torme (CD)" (1982). Visual & Performing Arts Faculty Music Gallery. 33.